WELCOME to Blackcomb Greens – one of the best locations situated on the Fairmont Chateau Whistler Golf Course.The peaceful, yet convenient location makes it ideal for families or those who prefer to be away from it all. There is a complimentary Village Shuttle is just outside your door making it easy access to ski lifts, village stores, restaurants and nightlife! In winter, Lost Lake Nordic trails are on your doorstep, perfect for cross-country skiers, snowshoe'rs and explorers. It is a brief 5 minute walk to the slopes, or the free village shuttle will take you straight to the lifts, village shops restaurants and nightlife. Depending on snow conditions, you can ski home via "Home Run". You will be amazed when you walk into this beautiful, open concept home with some of the best views from any home in Whistler. Upon entry there is a large mudroom with bench and lots of space for hanging wet gear and sports equipment. There is a huge modern, well-appointed kitchen featuring a heated slate floor, granite counter tops and stainless steel appliances providing all that is needed to cook up a big family meal or just a quick breakfast before hitting the slopes or the trails. Off the kitchen there is a large dining area with a beautiful wooden table that comfortably seats 8. In the living area there is a wood burning fireplace to cozy up to on the comfy sofas after a day of exploring the mountains. There is also a large deck with BBQ and seating for those glorious summer evenings. The master bedroom is located on the top level featuring a queen sized bed, private balcony and a huge ensuite bathroom complete with heated floors, jetted tub and separate shower. The second bedroom has two double beds and the third bedroom features two twin beds, all with those beautiful mountain views. You will also find laundry facilities in this home and it comes with one parking stall located in the underground. Free WiFi, cable tv and local calls are also included. To top things off Blackcomb Green offers an outdoor common area hot tub for some rest and relaxation at the end or the start of your day. 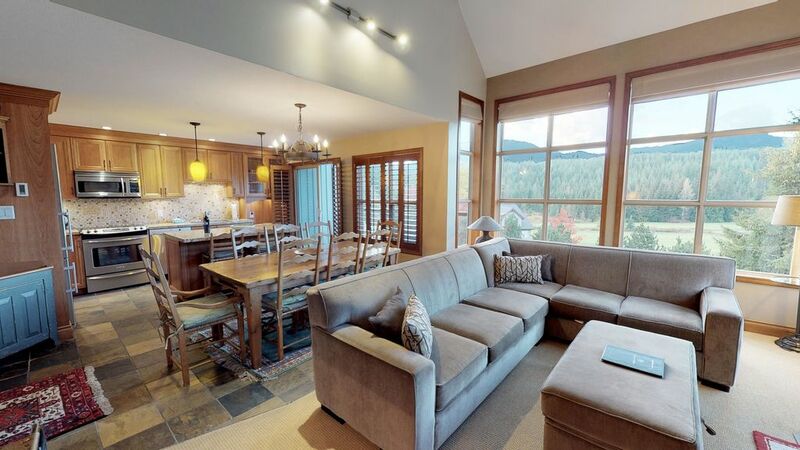 * Elegant & spacious 3 bed/ 2 bath, three level townhome w/ bbq on private deck & beautiful scenic views on the fairway of the Fairmont Chateau Golf Course * Modern & recently renovated * Valley trail, XC ski trails & free shuttle bus at your door! Condo was clean and convenient with shuttle access to skiing for our family trip! Beds were comfortable and we loved the hot tub.. Only thing that could be improved would be a few more towels. Thank you for your lovely review Michelle. We are so happy that you enjoyed your stay at Blackcomb Greens and all the amenities to go with it. Thank you for your suggestion on the towels, we do provide towels for each guest plus a few extras as well as complementary laundry powder for your convenience. We hope to see you back in Whistler again soon. This place worked perfectly for 8 adult friends. Spacious, comfortable and has everything you need. We'll consider staying again next time we are in Whistler. Additionally, catching the bus right outside to the village was very easy; we used this to get around. The only complaint is one parking spot for an 8 person place to stay. After the first night we were told by other owners of a condo that there are extra guest parking spaces (not in the locked parking area) that are free to use. Thank you for your great review. Parking in Whistler can be tricky, especially in the winter months. There certainly is guest parking at Blackcomb Greens however if you use this for more than 24 hours you run the risk of being towed, hence why we don't recommend this to guests. We are so happy that you enjoyed the unit and all it has to offer. The house was as advertised. We had a great time. Thanks for taking the time to write us a review, David! We're thrilled you enjoyed your stay and would happily host you again soon! Great for a family ski vacation. Great location. Perfect spaces for a family. We really enjoyed our time there. We had everything we needed. Well appointed, comfortable, and clean. Perfect for a family get away. In a quiet location, a 15 to 20 minute walk from the village, a great view over the golf course towards the north side of the valley. Restful and comfortable. Thank you very much for taking the time to leave us some great feedback. Blackcomb Greens is such a beautiful complex with those amazing views and a much more peaceful accommodation choice than being right in the village. We hope to see you visit again. Very nice and roomy property. Close enough to everything without being too close. Beautiful view. We would definitely recommend and come back. Very well maintained. Thank you for the glowing review, we are so happy to hear that you were able to enjoy this beautiful location and everything it has to offer, we look forward to hosting you again soon! All rates are subject to a 5% GST, 8% PST, 2% hotel tax &amp; 7% booking fee. PAYMENT At the time of booking, a non-refundable deposit of 25% will be required to complete your reservation. We accept Visa and Mastercard. This credit card may be billed automatically for any unpaid balance on the date the full payment is due, unless you discuss alternative payment arrangements. The balance of your stay is due 45 days prior to your arrival. For bookings made within 45 days of arrival, the full amount will be charged when the booking is made and is non-refundable. Prior to check-in, guests will be required to provide a credit card plus photo identification for a pre-authorization of $500. The credit card may be charged up to $500 after departure if property is damaged, requires excessive cleaning, or if items are missing. The credit card provided must be in the name of main guest.